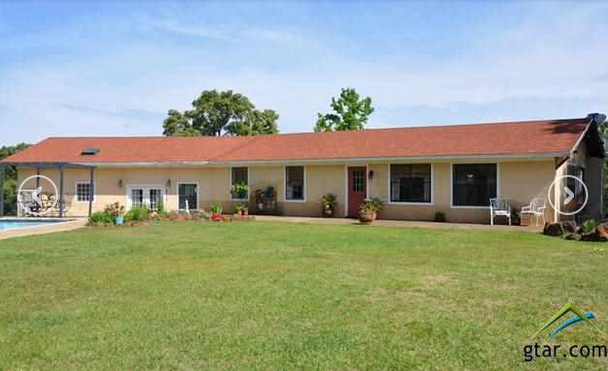 This sprawling one story 2,800 square foot traditional southern stucco home is now for sale. The home was built in 1989 on top of 25 acres of land in Overton, TX. The outside landscape and pasture compliment the many upgrades and features found inside of the home. This home is perfect inside and out for entertaining your guests during the day and night for any type of event. The quiet area is perfect for privacy and large enough to host large community events and parties. The front and back yard is maintained and landscaped with mature trees, bushes and tall green grass. The pasture is a great place to start your own personal or community garden. Walking to the back the grass encompasses a large rectangular swimming pool and patio spread over the entire length of the home. The chlorine swimming pool has a cleaning system keeping it clear all year long. A red barn is also featured in the back yard for storage and the occasional picture opportunity. The large Patio home includes central heating and air for 3 custom bedrooms and 2 baths. Additional rooms include 2 living areas, a large family room, and utility room with laminate and tile flooring. The large square windows overlook the outside pool and acres of green grass. The master bedroom includes a wood burning stove perfect for the cold winter nights for a natural heat source. Inside the luxury bedroom there is a separate sitting area and office space. The master bathroom has two sinks and a garden tub. The 2 guest rooms are spacious with large windows and perfect for a child’s bedroom. Interior features include a ceiling fan, skylights, blinds, a satellite dish and tall red curtains creating warmth all over the home. The kitchen has an electric oven and range with tiled back splash and stainless steel appliances. The kitchen also has a middle island for hosting dinner parties and cooking for the family with room to spare. Inside the wood cabinets are a dishwasher, microwave and pantry. The wooden roof top deck off the master suite is a peaceful and serine way to end an intimate evening with your loved ones under the stars. The home has an upper and lower deck to overlook the property, sky and the swimming pool and the green grass meadow. Entertain your family and friends with the two guest rooms, a large and upgraded kitchen and outdoor space that everyone will admire. With the 25 acres of open land you can create your own personal hobby or new adventure on this beautiful hidden utopia that nature has created.